Why Does Professor X Have Hair in Logan? Now that 20th Century Fox's Logan is getting closer and closer, hitting theaters in just over a month, fans are preparing for what will be Hugh Jackman's last performance in a Wolverine movie. There have been plenty of questions swirling around this project, including what year the movie takes place in, which James Mangold recently confirmed is 2029, five years after the X-Men: Days of Future Past prologue. Among the other mysteries swirling about is the peculiar fact that Patrick Stewart's Professor X actually has hair in this movie. But it turns out there is actually a perfectly good explanation for that as well. 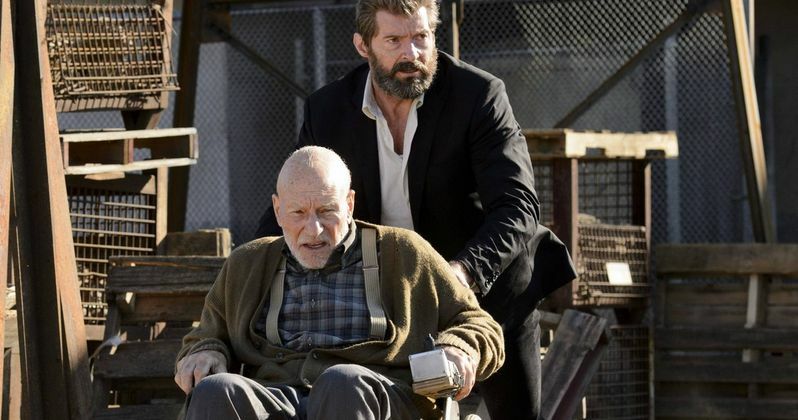 It has long been confirmed that Professor X has grown quite ill in Logan, and Hugh Jackman's title character has seen better days as well, in this story partially based on the iconic Old Man Logan comics. We have reported in the past that Logan has enlisted Caliban (Stephen Merchant) to help take care of the ailing Professor, who is suffering from memory loss and, at times, he can't even remember who Logan is. During a recent interview with Empire, director James Mangold stated that Hugh Jackman, "kind of looks like Clint Eastwood in Unforgiven", while addressing why Professor X has hair. Here's what he had to say, acknowledging that giving Professor X hair, "could be kind of sacrilege." "The theory was that he originally lost all his hair because it's just too damn busy [in his head] to grow hair. The idea for me was, well, maybe there's a little fringe on there, because things are slowing down mentally." Back in October, James Mangold took to Twitter to not only unveil the new poster, which confirmed the Logan title, but he also unveiled the second page of the Logan screenplay, which made a few things clear. One was that they were aiming for an R-rating, with plenty of adult language, but the other big takeaway is that the story is at least partially based on the Old Man Logan story. It isn't a direct adaptation, though, since Marvel Studios controls many of the characters who show up in that story, such as Hawkeye, Hulk and Red Skull. Regardless, Logan is finally starting to age in this story, with his healing power diminishing which results in the title character resorting to booze as a painkiller. Empire also spoke with Hugh Jackman, who revealed a little acting tip he got from his Eddie the Eagle co-star, Jim Broadbent, about playing an older character, which he used on Logan. "When he was playing older, Broadbent would tape a little stone to his heel. I would have that, just to remind myself of a limp. Logan's body hurts. His joints hurt. His heart hurts. Psychologically, he's damaged. What's the collateral damage of being Wolverine for all those years?" There have been rumors that Professor X may actually be killed off in Logan, with some theorizing that one of the many cryptic photos released before the trailer shows a number of bullet holes in Logan's limousine door, which is supposedly the same door Professor X was sitting next to in one of the other trailer scenes. While that certainly isn't confirmation of the character's death, Hugh Jackman revealed that Patrick Stewart is the actor's actual mentor off the screen as well. "I always tell my wife, 'when I grow up, I want to be like Patrick Stewart.' He wakes up every morning of his life, and for thirty minutes, he gets a cup of tea, and reads a book. He reads something he loves, every day of his life. This guy knows how to live!" The cast also includes Boyd Holbrook as the villainous Donald Pierce, Stephen Merchant as Caliban, Richard E. Grant as Dr. Xander Rice and Patrick Stewart as an ailing Professor X, along with Eriq La Salle in an unspecified role. James Mangold directs Logan from a script by David James Kelly and Michael Green. Logan could very well end up being one of this year's first blockbusters, hitting theaters on March 3, going up against Lionsgate's The Shack, The Weinstein Company's Leap and Open Road Films' Before I Fall.